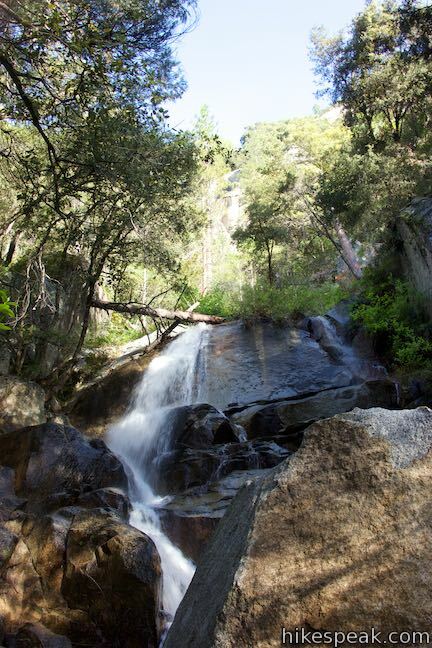 Is it possible to have a Yosemite National Park waterfall all to yourself? Yes! The odds of waterfall solitude are pretty low when you go to Yosemite Falls, Bridalveil Fall, or Vernal Fall and Nevada Fall along the Mist Trail, but unheralded Wildcat Falls is different. Although this multi-tier waterfall is about 650 feet tall, only the bottom 50-foot tall cascade at the base of Wildcat Falls is visible on this hike, wrapped in vegetation that creates a private retreat. Wildcat Falls is not a popular or well-known destination, which means you can probably spend hours sitting at the base of Wildcat Falls without being interrupted by another human. 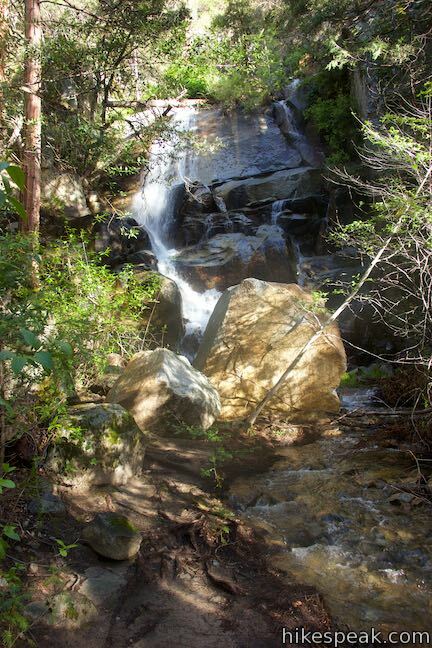 The short, unmaintained path to Wildcat Falls is 0.15 miles round trip with 15 feet of elevation change. 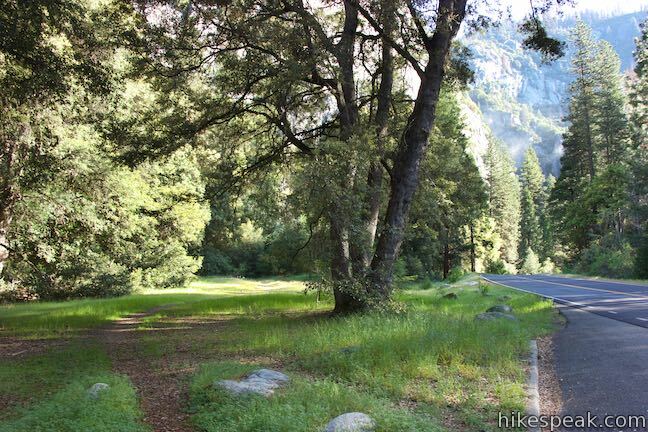 Entering Yosemite National Park via Route 140 from Mariposa, Wildcat Falls is basically the first waterfall you will cross, making it a good place to stretch your legs and get that first waterfall fix. 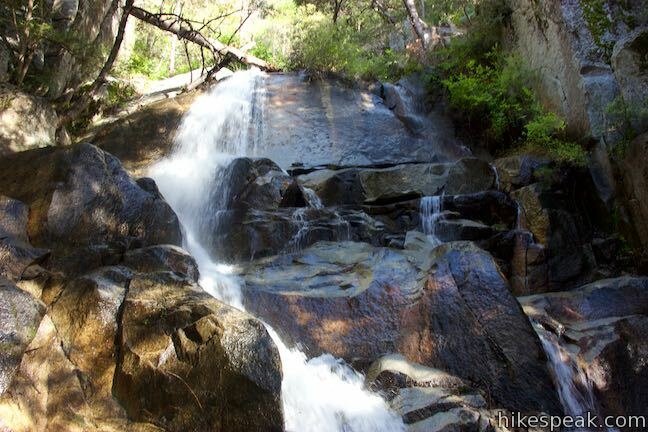 Wildcat Falls is located west of Yosemite Valley, just above El Portal Road (known as Route 140 outside the park). To walk to the waterfall, start from a turnout on the north side of the road, west of the Cascades Parking Area. From there, an unmarked single-track heads north, crossing a small grassy meadow along the side of the road. 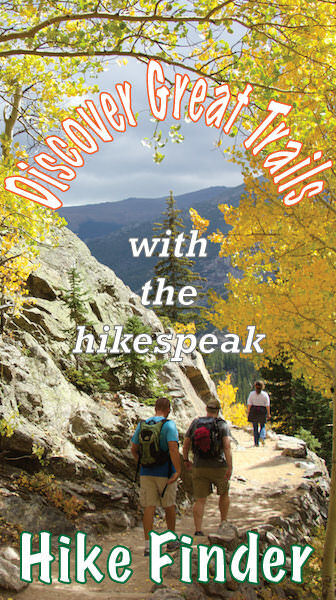 Enter a thicket and follow the path down to Wildcat Creek, just below a tumbling waterfall. Walk up along the bank of the creek, easing around brush and large rocks. The 140-yard long track to the foot of the falls is complete. 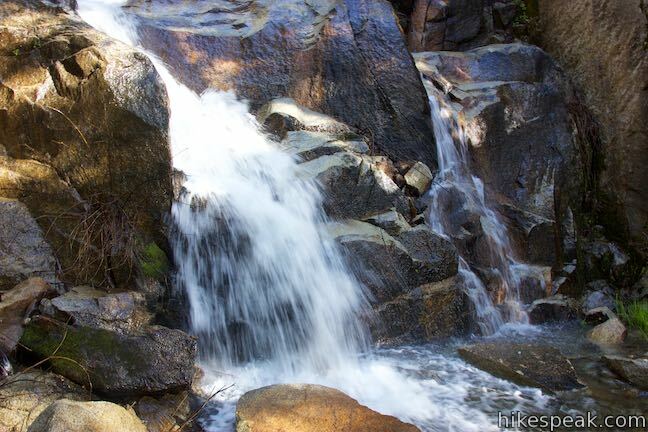 Step up to the base of Wildcat Falls and have a seat on a boulder. 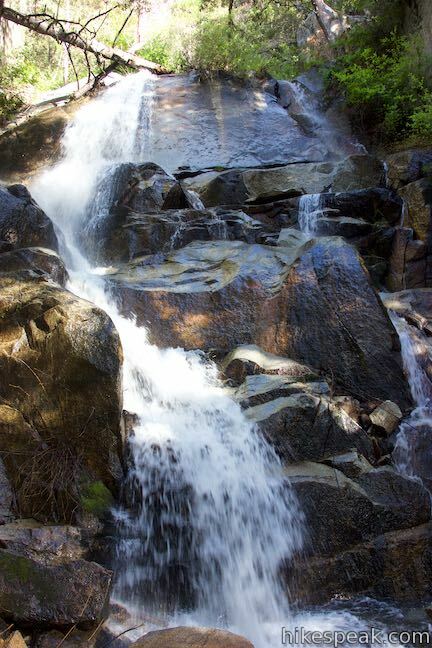 The tier of Wildcat Falls in front of you slides and tumbles about 50 feet down an uneven slope. 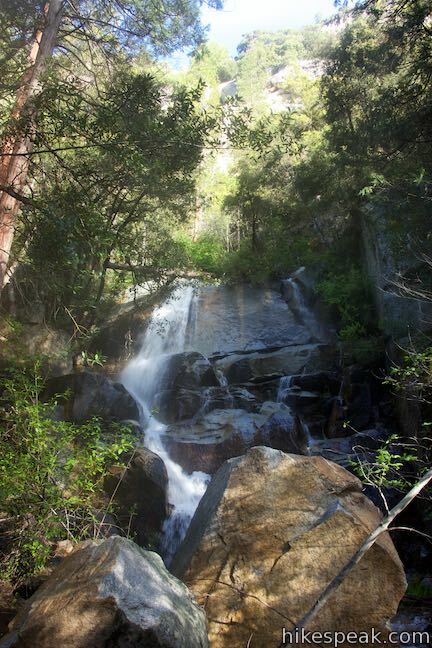 Looking up through the trees, an obscured tier of the waterfall can be seen easing down a granite wall. 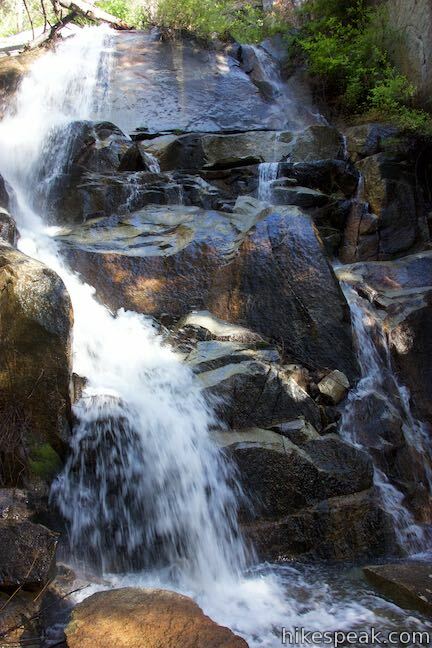 Wildcat Falls is a seasonal attraction. Wildcat Creek is fed by snowmelt and fades away by mid-summer. When the creek is lower, you can rock-hop across the water and follow another short path to the Cascades Parking Area. 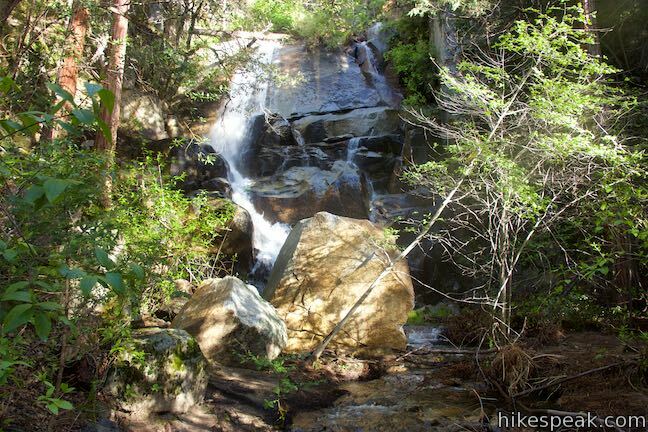 After taking a breather below Wildcat Falls, walk back the way you came. 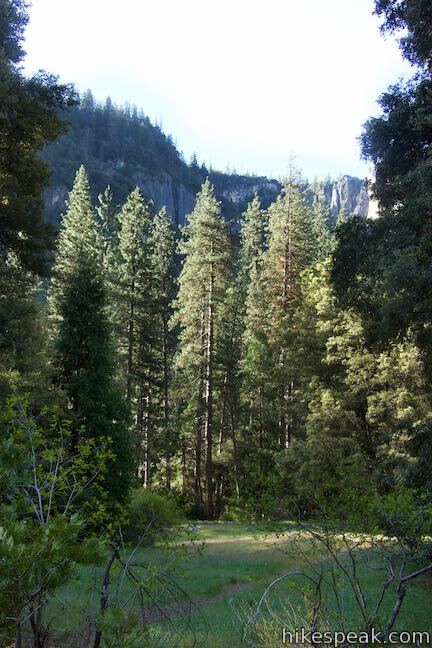 If you’ve built up an appetite, Cascades Picnic Area is just across El Portal Road to the east. 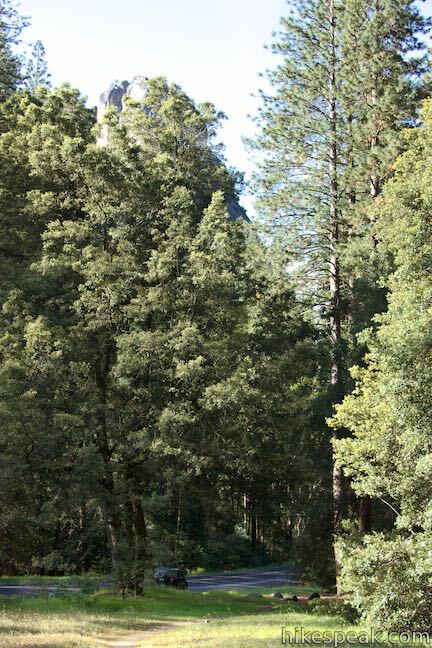 Dogs and bikes are not allowed on this short outing in Yosemite National Park. 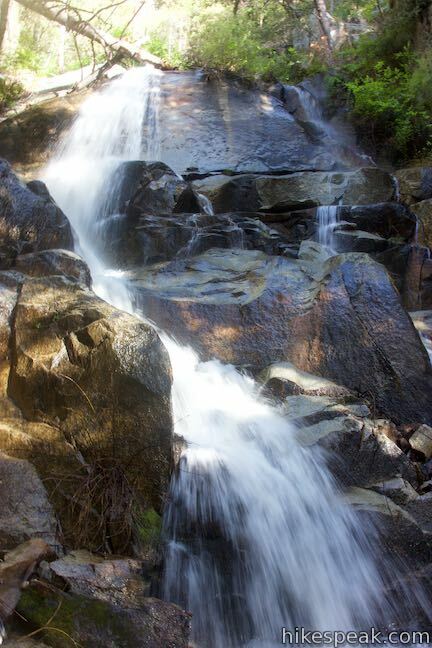 No permit is needed to visit Wildcat Falls, but the park does have an entrance fee. 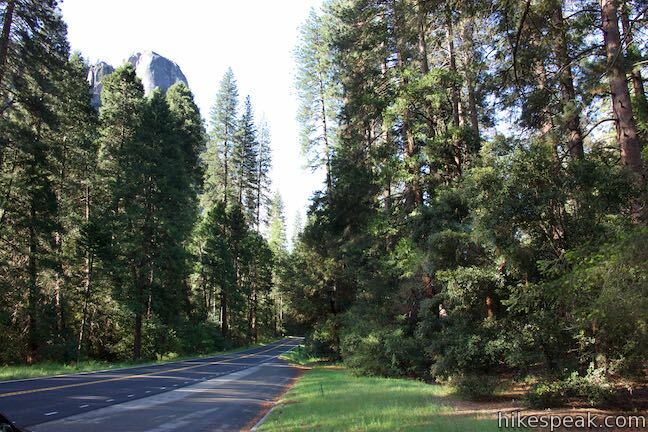 To get to the trailhead: From Mariposa, drive northeast on Route 140 for 31 miles to the Arch Rock Entrance for Yosemite National Park. Drive 2.7 miles and pass a turnout on the north side of the road where the hike to Wildcat Falls begins. Go another tenth of a mile and pull off into Cascades Picnic Area on the right. Turn around here and drive a tenth of a mile back along the road to the trailhead parking area along the side of the road. 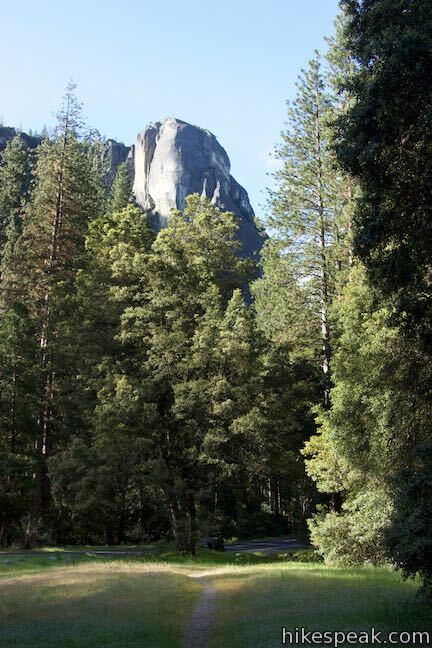 From Yosemite Valley, drive west on Northside Drive, which meets Southside Drive by Pohono Bridge and becomes El Portal Road. Drive another mile west and stay to the left through the intersection with Big Oat Flat Road. 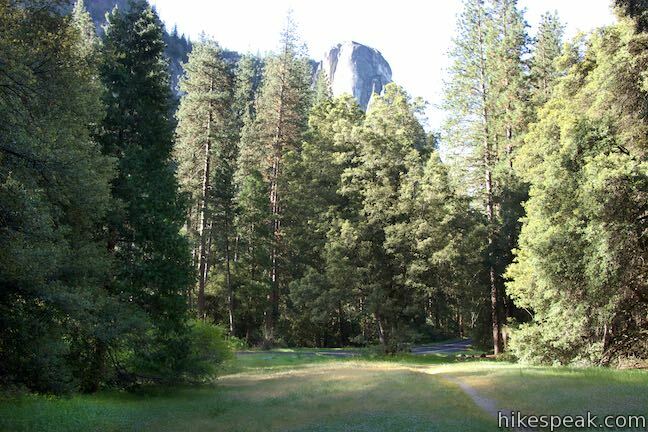 Continue for 1.9 miles on El Portal Road to parking spaces on the right, from which the path to Wildcat Falls begins. The trailhead is 0.2 miles past the larger parking area for the Cascades. These photos were taken in May of 2017. Click to enlarge.